This project aims to formulate a motion strategy that allows robots to safely handle critical communication failures in multi-robot systems where a central decision maker is specifying the movement of each individual robot. For each robot, the proposed algorithm computes a time horizon over which collisions with other robots are guaranteed not to occur. These safe time horizons are included in the commands being transmitted to the individual robots. In the event of a communication failure, the robots execute the last received velocity commands for the corresponding safe time horizons leading to a provably safe open-loop motion strategy. The resulting algorithm is computationally effective and is agnostic to the task that the robots are performing. Communication is not only essential for sharing sensor measurements and performing diagnostics, it is often an integral part of the closed loop control mechanism. In fact, in many applications and scenarios such as extra-terrestrial exploration, high precision manufacturing, and multi-robot testbeds, the robots frequently rely on communicating with a centralized decision maker for their velocity or position commands. In such situations, a failure in the communication network can severely hinder the motion of the robots and performance of the algorithm. This is the premise behind this project, whereby the adverse effects caused by intermittently failing communication networks are mitigated. In order to calculate the safe time horizon, we first compute the set of all possible locations that can be reached by a robot within a given time (i.e., the reachable set). This is followed by computing the time horizon for which each robot lies outside the reachable set of other robots. But, for the differential-drive robots considered here, performing such set-membership tests is computationally expensive owing to the non-convexity of the reachable set. Consequently, the reachable set is over-approximated by enclosing it within an ellipse whose convex structure allows for simpler set-membership tests and finite representation. 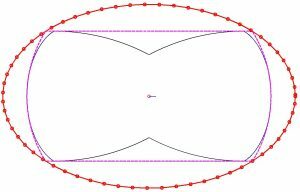 By minimizing the area of the ellipse enclosing the convex hull of the reachable set, we obtain the best ellipsoidal over-approximation of the reachable set in terms of the accuracy and effectiveness of set-membership tests. An ellipsoidal approximation (shown in red) is derived for the reachable set of differential-drive robots (shown in black). Taking advantage of this ellipsoidal approximation, the safe time horizon is defined as the longest time duration for which the robot lies outside the ellipsoidal reachable sets of other robots. Thus, the robot experiencing communication failure can execute its last received velocity command for the corresponding safe time horizon and remain safe. Beyond this, the robot stops moving. The safe time horizon represents the longest time duration for which the robot lies outside the ellipsoidal reachable sets of other robots. Thus, the robot experiencing communication failure can execute its last received velocity command for the corresponding safe time horizon and remain safe. Siddharth Mayya and Magnus Egerstedt. 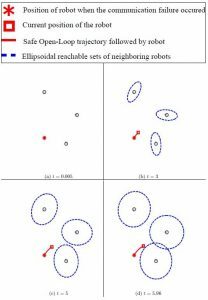 “Safe open-loop strategies for handling intermittent communications in multi-robot systems.” IEEE International Conference on Robotics and Automation (ICRA), 2017 . IEEE, 2017.